Portable: Designed to take shopping in your pocket, purse or briefcase. Durable: Beautifully printed on sturdy paper with a wipe-clean surface. Convenient: Includes a Contents card to help you pick the perfect recipe. This recipe box of cards was found at a discount bookstore here in Seattle for a few dollars. The design was different, cards instead of a book. The box itself is large and colorful. Who doesn’t love the color red to stimulate the appetite! It’s sturdy and able to stand up on it’s own, without needing propped up. The cards themselves are rather large, at 5″x7″ but they are sturdy, as promised. They can be propped against anything in the kitchen to look at while cooking. They really are too large to put in a pocket or purse, a briefcase, maybe. The pictures on the front are large and colorful, being professionally crafted by food designers at whatever food kitchen they were snapped at. On the back of the card, the font is easily readable. The ingredient lists can be somewhat intimidating to novice cooks, looking like a weekly grocery list instead of one recipe. The ingredients themselves are common enough, but may be difficult to find in all markets. The recipes themselves are easy enough for the home cook as well, some needing more time and patience than others. 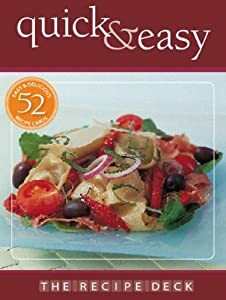 I would give The Recipe Deck: Quick & Easy four stars.